This appeared first as a 'published finalist' story in the Volume XVIII (2003) Writers of the Future anthology. It won me a trip to California for a snazzy, week-long writer's workshop and an awards ceremony. That marked the point in time when I first started to believe I might actually be able to write a short story that people might not wrinkle their noses at. It is a Pygmalian-like story where a genetic designer falls in love with one of his creations. A young boy learns about manipulation and loss from his intelligent bicycle. This story is actually an homage to Harlan Ellison's 'A Boy and his Dog'. I even hid Harlan's name in the story—but nobody noticed. For me though, the final few lines of the story call forward the final grainy image in François Truffaut's classic black and white film, 'The 400 Hundred Blows'. 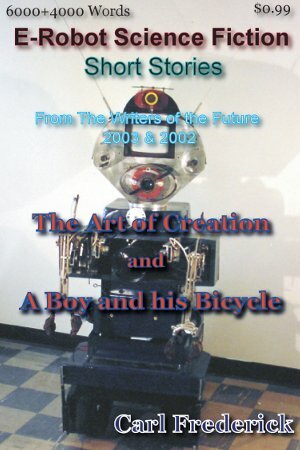 In 2002, 'A Boy and his Bicycle' took a first place in the 'Writers of the Future' contest. I have, understandably therefore, a warm feeling about this story. It is actually a rather early story in my writing career. But I think I'm too close to the story to know how well it holds up against my later works.